As the 19th century began, the farms on the Wolverton Estate were entrenched family concerns, with sons succeeding fathers as tenants. Thomas Harrison at Wolverton House farmed about 400 acres and after his death in 1809 the responsibility was taken on by his son Richard. Upon his death in 1858 the farm was managed by his widow Grace until 1869, and then by her son Spencer Harrison until 1892. I should add here that the Harrisons had other business interests and other sources of wealth and they probably employed a bailiff to manage the Wolverton House Farm. When Spencer Harrison gave up the farm in 1892, the Trust decided to separate Wolverton House from the farm and rent it as a large country house. In this year Warren Farm was created and the trust built a new farm house in the field that used to be known as the Warren. Henry Barrett was the first tenant and he remained there until his death in 1917. The Turney family then took over the tenancy, which they retained until 1970 when the entire estate was sold to Milton Keynes Development Corporation. Brick Kiln Farm has been tenanted by the Wilkinson family since 1742. Not only did George Wilkinson farm the land but he also made bricks and this tradition continued into the 19th century. The Wilkinsons were there for several generations until the death of George William Wilkinson in 1893 at the relatively early age of 45. This man, although had managed to carry off the idea that he had substantial wealth, was in fact living on borrowed money and was in debt at his untimely death to the sum of £1,100. The Trustees, themselves owed money, could not consider a further Wilkinson tenancy and this long period of family tenure came to an end. A man called I J Shirley took over in 1893 and farmed there until 1931. After this the Luckett family took on the farm until 1970. Once established, tenant farmers, were usually able to pass on the farm tenancy to the next generation. thus in all parts of the estate. The Ratcliffe family, for example had been on the estate since 1722, at Park Farm and Stonebridge House Farm. The Gleeds were established at Manor Farm and the Battams at Stacey Bushes Farm. As you can see from this 1834 map, there were six significant farms on the estate in the 19th century: Wolverton House, Wolverton Park, Manor Farm, Stonebridge House, Stacey Bushes and Brick Kiln. To these can be added Debbs Farm, no more than 90 acres, which was close to Stony Stratford and was later absorbed by the new Warren farm. When a survey was conducted for the Trust in 1847 the two largest farms were Brick kiln with 468 acres and Wolverton House Farm with 478 acres. Manor Farm had 323 acres under its control and Stacey Bushes 409 acres. 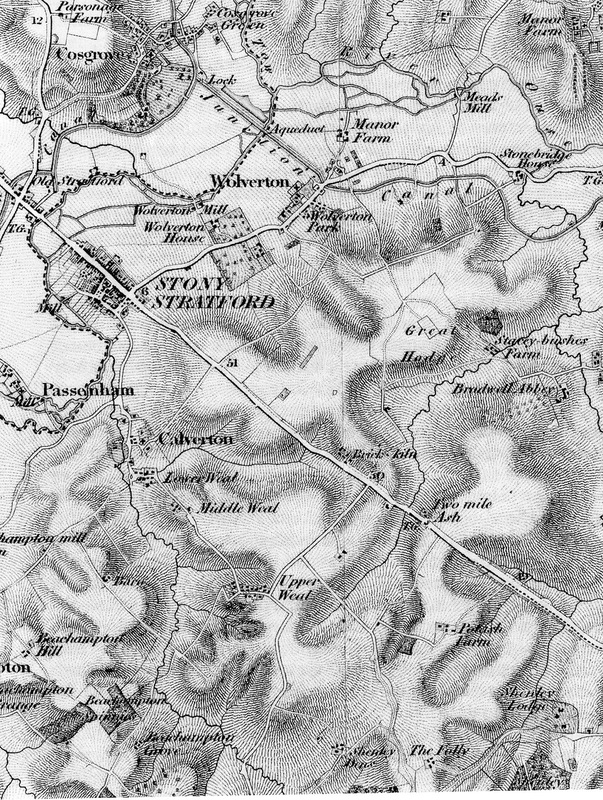 Stonebridge House in the east had lost land to the railway and was left with 318 acres. Park farm was smaller at 150 acres and Debbs Farm had only 89 acres. After this report Debbs Farm, which had been struggling under the last tenant, John Whiting, was absorbed by the Wilkinsons and Park Farm was split between Manor Farm and Wolverton House Farm. Wolverton Park Farm house was then rented to J E McConnell, Superintendent of the Wolverton Railway Works. Farming was very hard in the last quarter of the 19th century. Cheap corn could now be imported from North America and frozen sheep and cattle could now be brought to England from Australia and New Zealand, again at lower prices. As a consequence the Trust had to reduce their rents by 10% and 20% in the 1880s. Conditions were not to get better for British farmers until after WW II. As I mentioned earlier,, G W Wilkinson was heavily in debt when he died in 1892. A new farm house and buildings for Stacey Bushes farm was constructed in 1848 on Stacey Hill. The old farm buildings by Bradwell Brook were demolished. The Battams family continued to farm there until 1888. It was farmed by John Richards until 1920 and thereafter by Edward Norman until 1937. He struggled during the depression. He was succeeded by a member of the Luckett clan until 1960 and in the last decade of its existence by B C Gurney. Stonebridge House was also rebuilt in 1855 but continued under the tenancy of the Ratcliffe family until 1884. The Norman family occupied the farm until 1948. Then for 5 years it was let to Raymond Turney. The last tenant in its history was W E Gurney. Manor Farm had similar longevity of tenure, coming into the 19th century with the Gleed family it then passed into the hands of a branch of the Wilkinson family, who thereafter farmed it until 1929. The Whiting family then took over the farm for the last 41 years of its life.